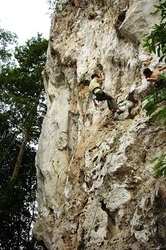 27 Aug 2010, After our last trip, my climbing buddy was started look for new place to climb in Malaysia and he found the new place for sport climbing in Jerantut Malaysia. 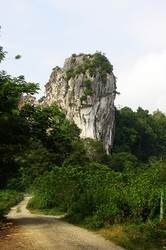 Jerantut is a small town located in the state of Pahang. There are approximately 20 single pitch and 1 2pitches sport climbing routes as mentioned on the website that we found, if you're not satisfied with 20routes, you might want to check out the waterfall near the Jerantut or go adventure the world's oldest tropical forest at Taman Negara(National Park) which is 1hour drive away from Jerantut. With the recommendation by 1 of our members, we got the nice and spacious SEMI-D house in the Jerantut town with 7rooms that cost us at RM15/pax, and many hostels are available too in the town area for budget backpacker. 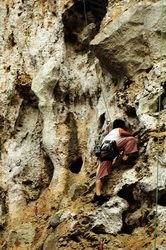 The climbing site is just 30mins drive from Jerantut town, the limestone outcrop cannot be seen from the main road and you will have to drive pass the village narrow road to reach the climbing wall, it’s stretches up to 60m high and shelter is available just in front of the wall. 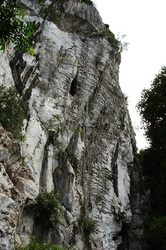 There are few more routes when you hike up towards right and be aware of the bee as me and my buddy climber got stung lucky we’re okay without any further reaction. 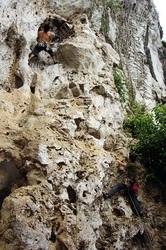 this is the risk of outdoor adventure activities, but it's fun. 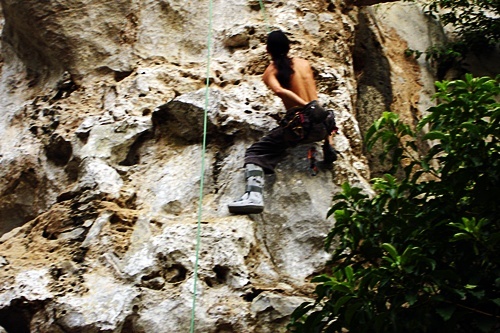 All the climbing bolts look new and routes are mostly short and vertical from 5-8bolts, we managed to climb most of the routes in 3hours time and decided to continue the next day. Next day, there was a local villager trying to collect fee of RM5/pax and they claimed that the climbing routes are setup by them using their own fund. By not wasted our time for negotiating, we finally decided to walk away as we felt that is unjustifiable.